Freshlook are coloured contact lenses that provide a natural look and excellent clarity of vision at surprisingly affordable prices. They’re made by optical experts Ciba Vision, renowned for their high quality lenses that supply sharp focus, all-day comfort and support eye health through a range of technological innovations. If you want a quality coloured contact lens that corrects vision and gives a gorgeous tint, Freshlook is the way to good. Ciba Vision brings their technological knowhow to the world of coloured contact lenses with the Freshlook family. These lenses use a palette of shades to produce lenses that complement the wearer. They’re streets ahead of the products of yesteryear, which had a tendency to look artificial. Freshlook lenses are available in a range of powers and frequencies, including monthly and daily disposables. 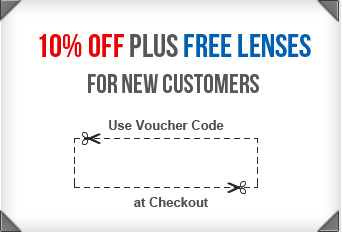 A range of smart features make Freshlook lenses ideal for a variety of wearers. A starburst print and double-layer print design makes Freshlook Illuminate ideal for Asian wearers. Meanwhile, Colorblends feature a custom-engineered system that blends three colours in one lens to enhance the wearer’s natural colour. It’s not just the palette of colours used that make Freshlook contact lenses a smart choice for modern wearers. Ciba Vision has engineered them to be particularly comfortable by keeping the water content high. This makes for better breathability, as oxygen can pass from lens to eye easily. Eyes can breathe effectively and stay naturally moist at all times. Hydrated eyes are healthy eyes. A moisture-rich lens helps to combat protein and deposit build-up, which can lead to infection, grittiness and dryness.